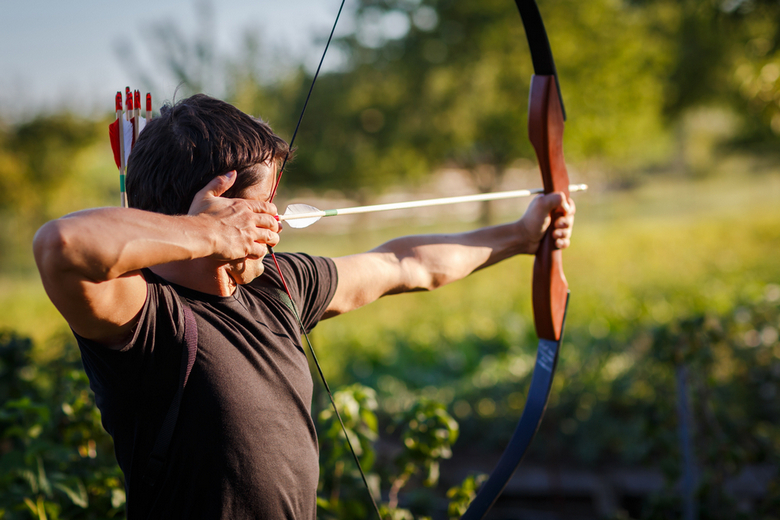 Instinctive Archery is a style of shooting that focuses on training the brain and body to use muscle memory and instinct to shoot accurately without aiming. Most instinctive archers prefer to use a “stick bow,” or a bow made of wood such as a longbow or a recurve bow without a sight. This is the most traditional style of shooting where the archer simply looks at their target, and, just like throwing a ball, aims using hand/eye/brain coordination. The alternative to instinctive archery is using a compound bow, which is specially fitted to a particular archer and a particular draw, with a particular set point—often the tip of the nose—and has sights for aiming purposes. Some people are just naturally excellent instinctive bow shooters, but for everyone else, mastering this skill comes from practicing often and using some tried and true tactics. First of all, your bow and arrow must be well matched to your body so that drawing it feels natural and comfortable. You’ll also need to take into consideration the arrow length, spine, and weight so that it complements the size and strength of the bow you use. Second; is that consistency is key, especially when it comes to form. Try to keep the same stance, draw length, anchor point, and so forth every time you shoot. Doing this will help to build up your muscle memory and you will become better at predicting where your shots will land, just based on your own movements. Of course these are just the important basics, so we’ve included a collection of additional resources at the bottom of this article. Why is Instinctive (and Traditional) Archery becoming more popular? In 2012 the Archery Trade Association (ATA) conducted the first nationwide archery survey and showed that 18.9 million Americans aged 18 and older participated in archery and/or bowhunting. Whilst this number seems very large, the survey was conducted in the same way as the Gallup Poll, so is considered scientifically accurate and not a random estimate. 1.9 million participated in bow hunting only. We were pleased to learn that one-third of all archery participants last year were women, and that 4 million women were involved exclusively in archery. These numbers prove the archery market is strong. They also indicate that archery appeals to a younger audience and that target archery appeals to women more broadly than bowhunting. One reason that the more traditional and instinctive form of archery is growing is that the population, and particularly younger generations, are becoming more earth-friendly with regard to natural and organic foods and products. This age group tends to be motivated by healthy lifestyles and organic foods, and often, a distaste for commercial farming, the articles cites. More and more people are growing their own food, and more importantly, wanting to know exactly where their food comes from, which supports the idea that more young people are picking up the sport of archery and bowhunting. Another reason that archery is becoming more popular, with young women especially, may be due to the influence of popular movies such as “Brave,” and “The Hunger Games;” in which the lead characters are women archers. Also, in accordance with the last two presidential elections, it could be assumed that America is headed for a more urbanized and liberal society, which may also have influenced the recent upward trend in interest in instinctive archery. In the first version of “Instinctive Shooting,” Mr. Asbell provides a, “…step-by-step guide to better bowhunting through better bow shooting.” This book is intended for beginners to the sport, and teaches the basics of instinctive shooting, from anchoring to aiming, and even has a chapter on how to craft one’s own arrows. Mr. Asbell’s second book on instinctive shooting, “Instinctive Shooting II,” is not a reprint, but a follow up to the first, and provides a more in-depth look at shooting and hunting using more traditional methods, and focuses on “…letting the shot come naturally.” The target points of the book include freeing oneself from “over-thinking,” and trusting in the natural instincts that each human has inside of them to hunt. Mr. Asbell’s third book, “Stalking and Still-Hunting,” is dubbed “The Ground Hunter’s Bible,” in which the message is that how a hunt is conducted and the equipment used is just as important as the hunted animal itself. This book encourages natural hunting skills by moving beyond the tree-stand, which has been a popular method of hunting in the past. In keeping with previous statements, stalking and tracking may also be becoming more popular than tree-stand hunting because it encourages physical activity, and usually a lot of it during each hunt. Mr. Asbell also touches on how to use a blind when hunting in this book. For a different perspective to G. Fred Asbell, “Instincive Archery Insights” by Dr. Jay Kidwell is another excellent book that teaches you how to shoot instinctively, with a greater focus on psychology and mental processes. Archery and bowhunting provides many benefits, from the natural and organic food movement all the way to enticing young people to experience and appreciate nature. It is a fairly inexpensive sport, and you can even learn to fashion your own bow and arrow if you so desire. It is also a sport that can be shared by the whole family and women are beginning to become a larger segment of the archer population. All in all—instinctive archery is a great way to connect with nature, hone your hand-eye co-ordination, and provide healthy meals for your family!